Ocean Front. Une unité de Chambre. Parfait état. Full Size Appliances. Joliment décoré Condo avec 10 pi. Plafonds. Nouveau sur le programme de location. Une chambre avec lit queen. Canapé-lit queen. Unité peut accueillir confortablement quatre. Balcon complète avec grill électrique et de l'ameublement (Morning Sun). 39 'HDTV à Den (lecteur DVD) et 24' HDTV dans la chambre. Acier / appareils noirs mettant en vedette céramique four à convection supérieur dans îlot de cuisine (des tabourets de bar), micro-ondes, lave-vaisselle et réfrigérateur. Cuisine avec cafetière, grille-pain, mixeur, blender et ouvre-boîte électrique entièrement équipée. Lavabo séparé dans la chambre principale. Beaucoup de placard de rangement. Murales sèche-cheveux. Planche et fer à repasser. Thought I was in the wrong place. It wasn't like the pics at all, it was more beautiful. The view was amazing from the balcony (22nd floor) when I had my hot chocolate in the morning. It is away from the crowded craziness of the touristy area but only a few minutes drive to get there. We drove a Chevy Traverse so we parked in an oversized vehicle lot which was very convienent. The only thing I would change is that we would of liked to stay longer. I would highly recommend you book this condo. Great location in Myrtle Beach, restaurants and shopping all within reasonable driving distance, direct on beach, great view from balcony, well kept building, great pool, apartment quite small (just two people), well equipped unit, clean, but did not use any pots or pans, nor electric BBQ (was filthy and no brush, nor tools), pull-out couch not comfy to sit on, bathroom and separate vanity were great to have, also lots of storage in bedroom closet and dressers. This property looked just like the pictures! It was directly in front of the beach and very convenient with 2 small children. We would definitely rent this property again! I have only positive things to say about the condo and the amazing view from its balcony! My girlfriend and I stayed in this condo for 5 nights and we had a great time. The condo is beautifully decorated and there's plenty of space for company to come and relax. Everything is very clean and tidy. The view of the ocean from the balcony is nothing short of perfection. 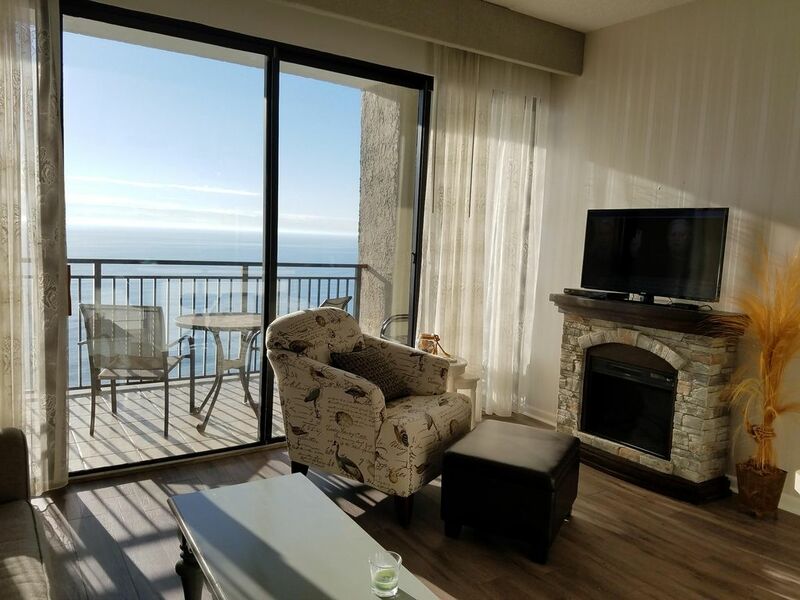 The condo is on the 22nd floor so you can see the beach coast for miles. Looking off the balcony is like a scene from a movie (if you're scared of heights the view would probably freak you out a little being that it's so high in the air haha). We thoroughly enjoyed our stay and we HIGHLY recommend this condo!!! $90.00 cleanup fee for end of stay. $90.00 per cleanup during stay. Check-in Time 4:00 pm Check-out Time 10:00 am "Firm" Late check-outs will incur a penalty payment of $100.00.